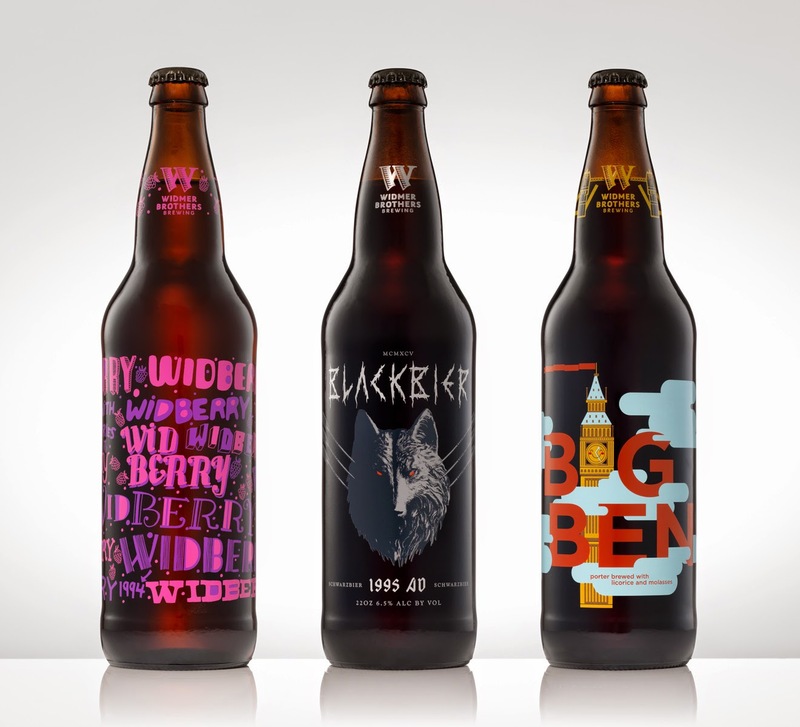 PORTLAND, Ore. – July 28, 2014 – Widmer Brothers Brewing today announced Widberry, Blackbier, and Big Ben Porter as the newest releases in the brewery’s 30 Beers for 30 Years Series. These limited release beers, brewed to commemorate the brewery’s 30th anniversary, will be available in the Portland area beginning this week. As with the other releases in this series, these three beers are among the most memorable in Widmer Brothers’ 30-year history. Widberry, a weizenbier brewed with local black raspberries, was originally introduced in 1994 and reached a level of popularity that no one at the brewery anticipated. Blackbier, a take on the German Schwarzbier style, was originally introduced in 1995 and is a favorite among the brewhouse veterans. Big Ben Porter represents the year 1996 and was one of the first craft beers that caused a dispute with the government over legal beer descriptions. Blackbier is a great example of the brewery’s longstanding tradition of putting its unique spin on classic German styles. Blackbier is a German Schwarzbier, but instead of following the German tradition and fermenting it as a lager, the brothers fermented this version as an ale, as they did with many of their interpretations of German styles, with Widmer Brothers’ house Alt yeast. It is also higher in alcohol by volume than most traditional Schwarzbiers. In 1996, Widmer Brothers went through the process of beer and label approval for Big Ben Porter – a London-style porter brewed with molasses and licorice. Widmer Brothers was told that it could not be referred to as a “traditional” London-style porter. The brewing team strongly disagreed and gathered evidence that proved Big Ben was brewed in traditional fashion. It was the first dispute with a positive outcome for the brewery, but certainly would not be the last. Big Ben Porter is also known as one of the most difficult beers to brew in Widmer Brothers’ history. Longtime Widmer Brothers Brewer Angel Marquez once risked life and limb for this beer, climbing into a kettle of boiling wort to dislodge a sticky sack of licorice. All three beers are part of an ambitious project in which Kurt and Rob Widmer got together with their brewing team to select 30 beers that represent individual years in the brewery’s 30-year history. Widmer Brothers started releasing small batches of important beers in the company’s history to the Portland market starting in April, the month Widmer Brothers was founded in 1984. All beers in the series are brewed to the exact specification from their original year of release. Widberry, Blackbier, and Big Ben Porter will be available for the next few weeks in the Portland area in 22-ounce bottles and on draught. Fans of these three beers and those looking to try them for the first time are invited to Bailey’s Taproom (213 SW Boadway in Portland, OR) on Wednesday, July 30 at 5pm for a special release party. Like all beers in the 30 Beers for 30 Years Series, an extremely limited quantity of each beer was brewed and packaged with unique label art from 30 different local artists and designers. Kate Bingaman-Burtdesigned the Widberry label, Orion Landau brought his style to the Blackbier label, and Bethany Ng created the Big Ben Porter label. To see the labels and learn more about the artists and the project, please visit www.30beersfor30years.com. About Widmer Brothers BrewingFounded in 1984, Widmer Brothers Brewing is celebrating 30 years of beer in 2014. Founders Kurt and Rob Widmer helped lead the Pacific Northwest craft beer movement in 1984 when, in their 20s, they began brewing unique interpretations of traditional German beer styles. In 1986, Widmer Brothers Brewing introduced the original American-style Hefeweizen, which elevated the brewery to national acclaim. Since then, the brewery has continued to push the boundaries of craft beer, developing a variety of beers with an unapologetic, uncompromised commitment to innovation. Based in Portland, Ore., the brewery currently brews a variety of beers including Alchemy Pale Ale, Upheaval IPA, Hefeweizen, Drop Top Amber Ale, a full seasonal lineup, and a series of limited edition beers. For more information about Widmer Brothers Brewing, visit www.widmerbrothers.com.